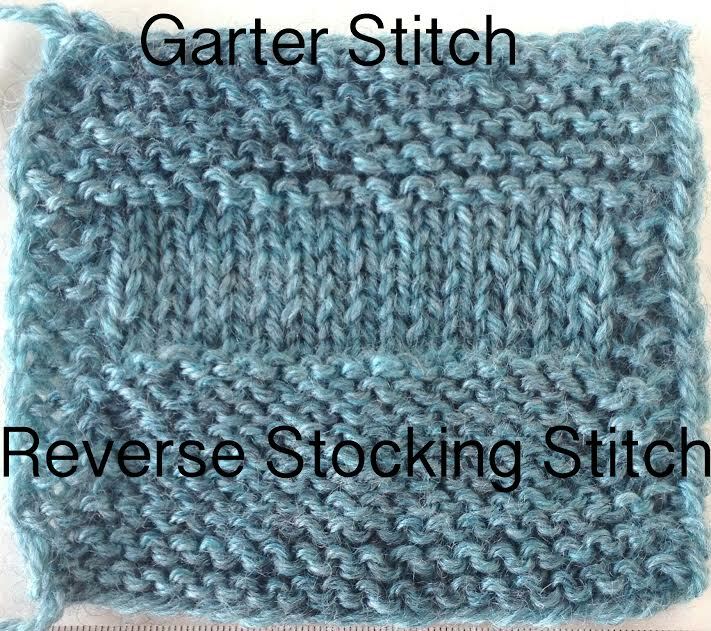 The next challenge new knitters face when reading their knitting is seeing the difference between reverse stocking stitch and garter stitch. This one is the often the fault of teachers. 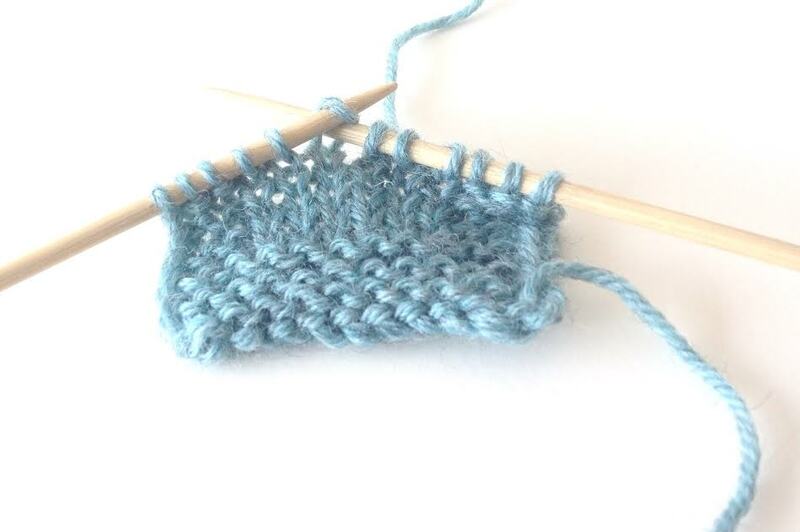 Most of us tell the knitters to look for the v or the bump while we teach the difference between knit and purl. We do this because at early learning stages we give the simplest possible explanation. 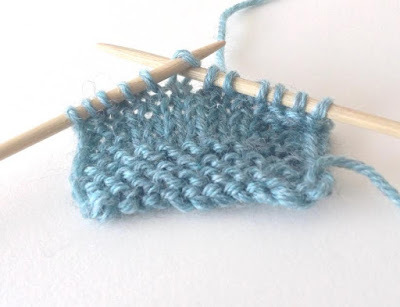 When we get to garter stitch the knitter sees all those bumps and says "AHA those are purls, this must be reverse stocking stitch". They are right, they are seeing purls but now they need to add on a new understanding of how those bumps are laid out. Look carefully at the top and bottom of the photo above. It's edged with garter stitch. Can you see how in garter stitch the stitches show a horizontal alignment? Now look at the photo below and see what happens when I pull the fabric apart. 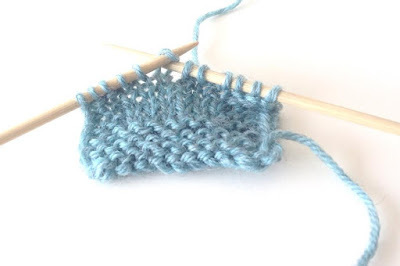 Garter stitch has wider recessed sections between the rows of purl bumps. 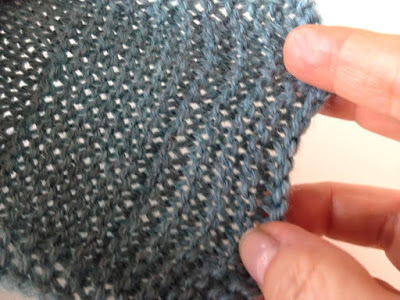 When I'm swatching garter stitch I check those rows, if they are really obvious it may mean I need to go down in needle size. Stitch orientation is the other topic I'd like to address here. 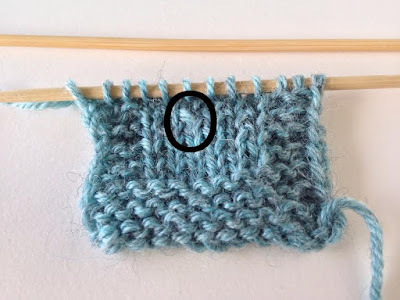 Different knitting styles exist which don't follow this standard however, almost all written materials assume this stitch mount. If you knit in a different manner it is not wrong, you just need to be aware of it so you can adjust accordingly when it is required. The yarn goes over the needle from the front to the back. The front leg is on the right, the back leg is at the left. You can see my needle has been inserted ready to knit, notice the back leg is to the left. Here's another angle. 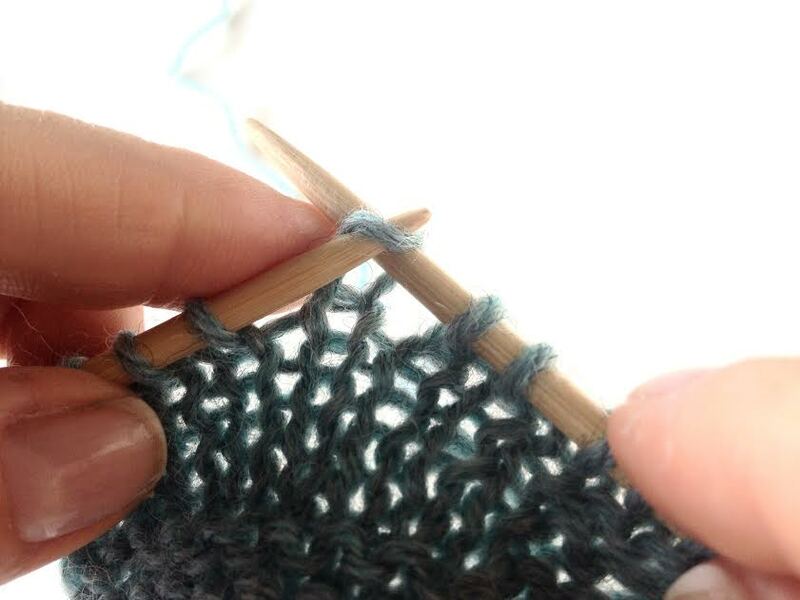 Sometimes we purposely change the stitch mount to make specific changes to our knitting as part of a stitch pattern. We often create an incorrect stitch mount when we are correcting errors such as picking up a dropped stitch or when we tear back a few rows and replace the stitches on our needle. 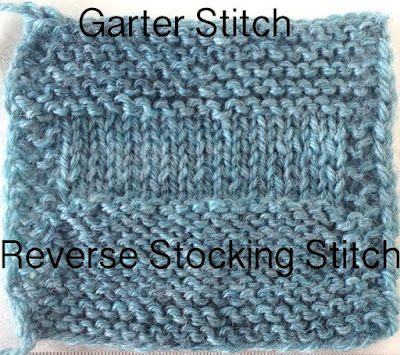 Here's a twisted stitch worked with incorrect orientation. You can identify it by looking at the base of the stitch, you can see the leg crosses at the bottom of the stitch and it doesn't lay smoothing on the plane of the fabric. Until you stated the orientation of your working yarn. It's always possible that you are untwisting when you work the wrong side. It's an alternative knitting style. This is the sort of thing you need to figure out with yarn and needles in your hands. What's your Yarn Inconsistency Tolerance Level?